- Fidelity to the Church, especially in making practical decisions at the Council of Trent. - His extraordinary devotion in renovating Christian Life, Priestly Life and the Religious Life of his time. 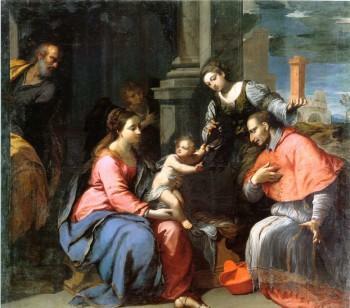 - His humility, love for the poor and sick, and heroism during the time of the plague in Milan. We the Borromean Sisters, pray to our Patron Saint for a triple love: the Love of God, especially to our Lord Crucified, the love of the Mother of God, and love to our neighbor, especially the poor and the suffering. This celebration is the most important of our Congregation, because onthe 18th of June, 1652, thisInstituteofCharitywas founded as the Society of the Holy Family of Jesus, Mary and Joseph. These three saints are examples to us in the fulfillment of our vows. We ask them for the grace to remain united in our religious family in harmony and faith. We honor Saint John as our Patron Saint. He is the example of virginal love to Our Lord. We remember the parish of our first mothers in Nancy which is consecrated to Saint Sebastian. We ask him for clarity and security in our consciences so that we are not dazzled by earthly delights and fears. He is venerated by all Charitable Associations as their Patron Saint. He was humble, faithful, and had extraordinary simplicity. He completely consecrated his life to the poor, thus beginning his most successful charitable work in the history of the Church. The first Mothers in our Congregation took on the first rule of life – the rule of the Sisters of the Visitation – written by Saint Francis de Sales. This is the reason why we honor him as one of our Patron Saints. From him we ask for gentleness, joy, and devotion in the service of God. With this date in 1679, our first Mothers proclaimed for the first time the vow Constant Charity. We celebrate this date as the feast of our Congregation. With other women, Mary Magdalene was faithful up to the foot of the cross and the Holy Sepulcher. Like her, we want to be the first messengers of the Resurrection. As Martha served the Lord with love, we too want to serve those entrusted into our care. To him we commend all the sick in body and soul, and we ask for his merciful love. We ask him for authentic vocations for our Congregation that surrender themselves to God for the building of his Kingdom.